Sarehole Mill (grid reference SP099818) is a Grade II listed water mill (in an area once called Sarehole) on the River Cole in Hall Green, Birmingham, England. It is now run as a museum by the Birmingham Museums Trust. 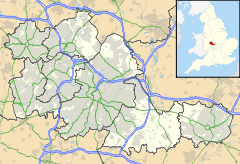 It is known for its association with J. R. R. Tolkien and is one of only two working water mills in Birmingham, with the other being New Hall Mill in Walmley, Sutton Coldfield. Built in 1542 on the site of a previous pool. It was once known as Bedell's or Biddle's Mill after the name of an early owner. In 1727 it was described as High Wheel Mill. As early as 1755, the mill was leased by Matthew Boulton, one of the pioneers of the Industrial Revolution and leading figure of the Lunar Society for scientific experimentation. It is believed he converted the machinery for use in metal working. As well as milling grain it has been used for grinding bones for fertiliser, metal rolling (Matthew Boulton) and wire drawing. The current building dates from 1771 and was in use until 1919. Thereafter it fell into a state of disrepair and dereliction. A local community campaign to save the mill was launched when demolition was mooted, and was finally successful with the mill being restored in 1969. Sarehole Mill is open from Easter to the end of October, 12:00 till 16:00 every day except Monday unless Monday is a national holiday in which case it is open, entry £3.00, children under 16 free. In April 2012 the mill pond was drained to repair the sluice gates, and in the winter of 2012–13 the heavily silted mill pond was dredged. In 2012/2013 Sarehole Mill underwent a £375,000 overhaul of the roof, chimney, millpond, water wheel and machinery were restored to produce flour again. A newly constructed outdoor bread oven is used regularly to bake bread using the flour ground on site. Sarehole Mill has a team of 10 volunteer millers, 15 volunteer gardeners and eight volunteer guides. Millers are at work every Wednesday and Sunday if there is enough water. Sarehole Mill produces wholemeal flour which is sold in the mill shop. The flour is also used by local restaurants and bakers. In 1852 the water wheels at Sarehole Mill were supplemented by a single cylinder steam engine. Although water would have been the primary energy source powering the mill, the addition of a steam engine would have ensured uninterrupted operation of the mill. Unfortunately the original steam engine was at some point removed, the current engine is of similar size and capacity, being a single cylinder table engine of 16 hp (12 kW), albeit currently in a non-functioning state and of unknown manufacturer. The current engine was installed as part of the restoration of the mill in 1975. It was formerly used by a sweet manufacturer, Smith Kendon Ltd, at their factories in England and Messina, Italy, where it was used up until 1948. It was donated to the Birmingham Museum of Science and Industry in 1952 before being moved to Sarehole. It was a kind of lost paradise... There was an old mill that really did grind corn with two millers, a great big pond with swans on it, a sandpit, a wonderful dell with flowers, a few old-fashioned village houses and, further away, a stream with another mill. I always knew it would go – and it did. The grounds nearby host the annual Tolkien Weekend event that celebrates the life and works of Tolkien. The mill is part of the Shire Country Park. Birmingham, page 13, Douglas Hickman, 1970, Studio Vista Ltd.
^ a b "English Heritage Pastscape website page for Sarehole Mill". Retrieved 29 August 2011. ^ "The 1905 View of Sarehole Mill hat Inspired J. R. R. Tolkien". Birmingham Mail online. Retrieved 26 November 2012. ^ Ezard, John (28 December 1991). "The Guardian 1991 article on Sarehole titled Tolkien's shire". London. Retrieved 29 August 2011. Wikimedia Commons has media related to Sarehole Mill. This page was last edited on 31 January 2018, at 23:55 (UTC).